​​Henry John Hill, known as Harry, was born in 1876 in Frampton, the eldest of the two sons of John Hill, a labourer, and Sarah née Guy. Neither of his parents could write when they had married two years earlier at St Mary's. It was an unsettling time for John and Sarah for the cottage they rented from Henry James Clifford, close to the end of Marsh Lane, was under threat of being pulled down. Harry's brother, Frederick, was five years his junior. With a young family to support, John soon became a mariner. By 1891 Harry was working as a farm servant but was a waterman on the barges in 1901. At the time of the 1911 census, Harry was living in present-day Tudor Cottage, The Street, a labourer awaiting his marriage to Emma Townsend on 22 April at St Mary de Lode, Gloucester. Their son, Henry George, was born in 1913. A record of Harry's war service has not been found; however, a surviving photograph (see our Gallery) shows him in Army uniform. He was an absent voter in 1918-19, and his contribution is remembered on the plaque in the village hall. 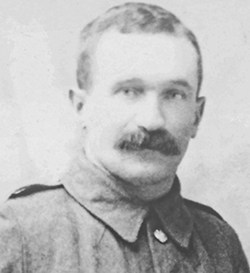 Henry John Hill died on 18 January 1935.